Add a touch of comfort and colour to your child's bedroom, nursery or playroom. 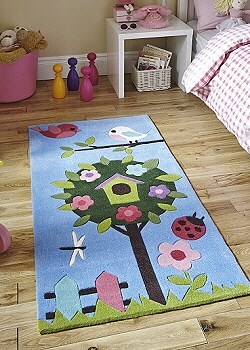 Our children's rugs come in a variety of fun, cute and colourful designs to suit all ages. Choose from boys cars or dinosaur rugs, girls heart and butterfly rugs, fluffy bears, glow in the dark, jungle and spaceship designs. Our kids rugs will add a personal touch, as well as being a practical solution for protection and wear and noise reduction. View our collection of Children’s rugs in a wonderful array of designs and fabrics.